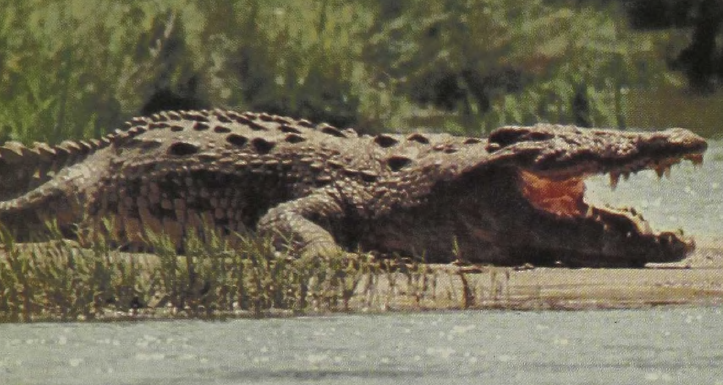 This is the second largest ofthecrocodilians, reaching approximately 19 feet and weighing 2,000 pounds. These effective predators once occupied a range from the vicinity of the Cape of Good Hope, across much of Africa, and down the Nile Valley into the Mediterranean. Today they are restricted to populations in isolated preserves. The males apparently have breeding territories, and the females deposit and bury a hundred or so eggs above the high-water line on sand banks of shorelines. The young call when they hatch and the female digs open the nest, picks them up in her mouth, and carries the hatchlings singly or in pairs to the water. Adult males have been knowji to attack motorboats, apparently mistaking the sound of the outboard for the signal of a competing male.